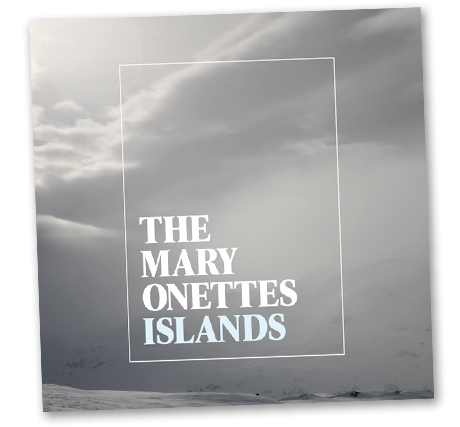 The Mary Onettes are a Swedish band – specifically they’re from Jönköping, which for such a small city has produced quite a large number of very famous people (Dag Hammarskjöld, Agnetha Fältskog, I’m From Barcelona and Nina Persson among them). Islands, the Mary Onettes’ second full-length CD and follow-up to 2007’s self-titled CD, is emotive and winning. Singer/guitarist/lyricist’s Philip Ekström’s voice conveys his beautifully crafted lyrics perfectly. I have come across a few comparisons to the band a-ha when reading about the band and this is apt – at times Ekström’s voice does recall Morten Harket’s. This is a very good thing indeed. God Knows I Had Plans is perhaps the track where this comparison hits the hardest. All songs on Islands are top-notch synth, with the glittering sounds of Puzzles (including the sullen lyrics I’m going out to stay up all night/it hasn’t been the best year/ . . . do you feel strange from the inside? ), the rending Dare, Once I Was Pretty and Cry for Love (. . . just a matter of time/till they put me in my grave). I also love the uniqueness of Whatever Saves Me – I remember my broken heart/my broken nose. The band suffered a couple of disastrous events when a hard drive with their music on it got stolen, and then the backup hard drive crashed. I am relieved that the Mary Onettes were able to reconstruct their songs and deliver such a remarkable CD! Islands (Labrador Records) is to be released on November 3rd in the United States.